Jorie Roberts is the founder of Marjorie Roberts, PC, a firm composed of attorneys who specialize in tax, corporate/securities, and business law, and work with the economic incentive programs in Puerto Rico and the U.S. Virgin Islands. She has a vast knowledge of tax law and holds law degrees from Harvard University, Cambridge University, and New York University. 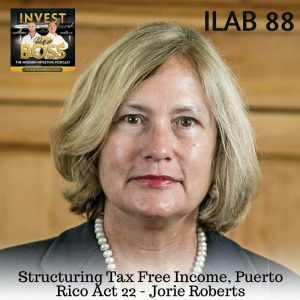 During the episode, Jorie explains two tax laws, known as Act 20, the Export Services Act, and Act 22, the Individual Investors Act, which shields new residents of Puerto Rico from paying most federal income. And since these laws apply to the residents of Puerto Rico, Jorie discusses the process and requirements in applying for residency. Also, she gives comprehensive examples on what is eligible for tax exemptions. Listen to ILAB 88 on iTunes here or subscribe on your favorite podcast app. 04:01 – Acts 20 and 22: What they are and who they’re for? 10:15 – Is owning Real Properties required? 11:45 – How can expats benefit from the tax exemptions? 16:29 – Are Interests and Dividends taxed? 29:25 – What is eligible for tax exemption? If you enjoyed this episode, do us a favor and share it! Also if you haven’t already, please take a minute to leave us a 5-star review on iTunes and claim your bonus here!